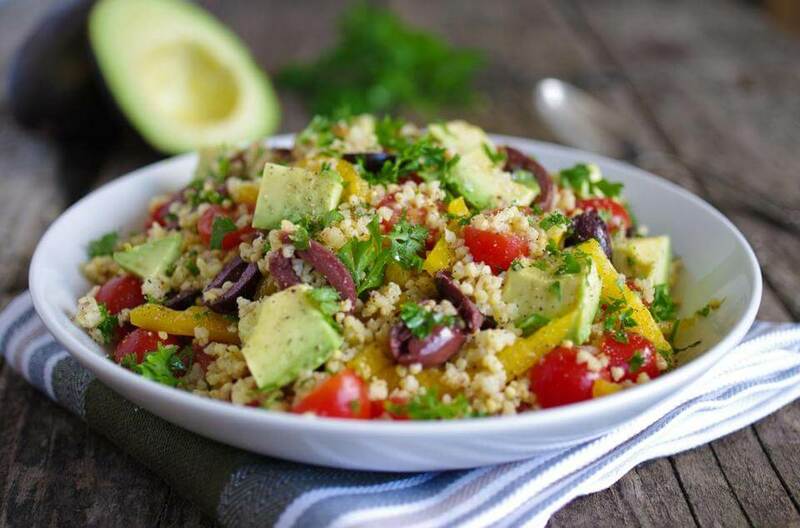 Try this awesome vegan millet avocado salad and prepare it for a dinner. Millet is a light very healthy grain, good not only for your health it is also good for beauty . It has a lot of protein and is a source of B vitamins. Avocado everybody knows is healthy and nutritious and can be eaten every day. Here is a recipe mixed with a tasty delicious dressing and vegetables and herbs . A whole grain millet salad which may get one of your favorites. Millet is an ancient grain which we may hear of and use it more in the future. Millet is gluten- free. A simple lemon-lime dressing makes this whole-grain salad burst with refreshing and bright flavors. The slightly crunchy millet is a nice contrast to the creaminess of the avocados. 1. In a bowl, whisk the lime rind and juice, and lemon rind and juice with salt and pepper. 2. Gradually whisk in the olive oil until the dressing emulsifies. Taste for seasoning and add more salt and pepper, if you like. 1. In a dry, heavy-based saucepan over medium heat, toast the millet, stirring constantly, for 3 minutes, or until the kernels start popping and brown lightly. 2. Pour in the stock and bring to a boil. Lower the heat and cover the pan. Simmer for 20 minutes. Turn off the heat and let the millet sit in the covered pan for 10 minutes more. Transfer to a large bowl; cool for a few minutes. 3. Add half the dressing to the warm millet; stir thoroughly.